A man who had to be rescued by the coastguard after jumping from cliffs into the sea has prompted a warning about the dangers of tombstoning. The male was one of a group jumping from cliffs at North Landing in Flamborough on Wednesday afternoon. He managed to climb into a cave and await rescue, suffering only minor cuts and bruises. The helicopter from Humberside Airport was sent as well as Bridlington rescue crews and the Flamborough lifeboat. 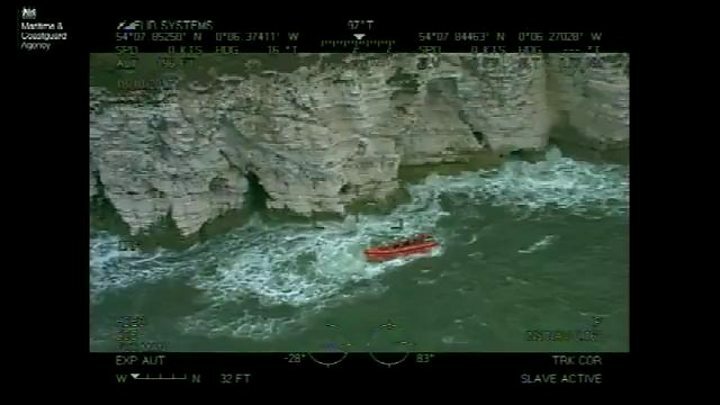 The Maritime & Coastguard Agency has released footage of the rescue from their helicopter to stop people tombstoning - an activity which involves jumping off cliffs, piers, or harbour walls into water for fun. Bev Allen, from Humber coastguard, said: "[It] can be very dangerous - there's a reason we refer to it as tombstoning. "The depth of water can dramatically change with the tide and you don't know what hazards may be lurking under the surface. "If you do want to jump from height into the sea we would advise people to join a coasteering group with a professional and reputable adventure centre."